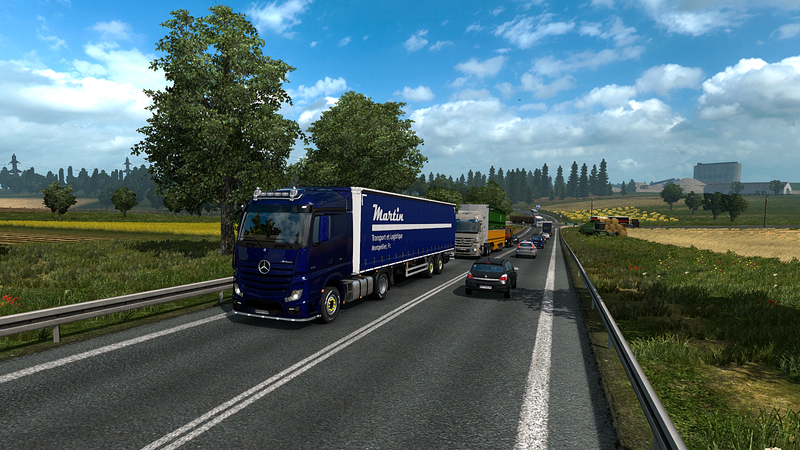 This week with the upcoming release of the new Oregon DLC in American Truck Sim I’ve done nearly all my driving in Europe. I have positioned my Mack in San Francisco which should be a good jump off point for jobs into Oregon. That DLC releases today and I guess I’ll be driving in ATS for much of the coming week. However, what’s been happening in Europe? Working towards getting my second truck and trailer meant doing longer, better paying jobs. This self-evident ‘truth’ became a reality after dropping off a delivery in Köln… …because from here I picked up a job going to Olsztyn in Poland. 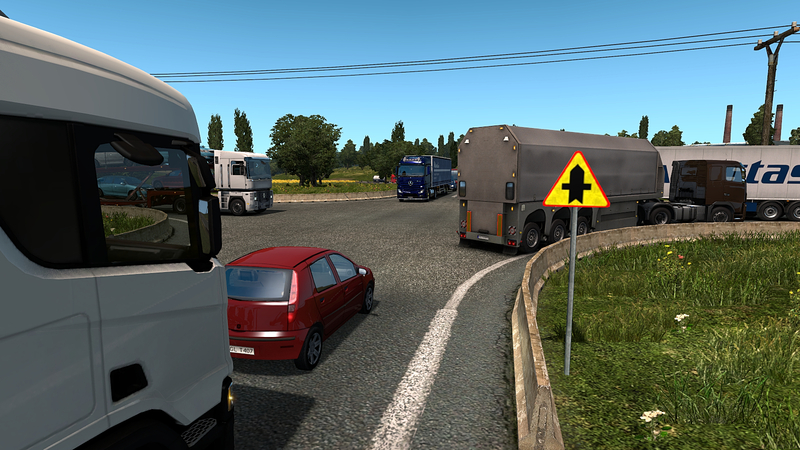 I don’t often go ‘east’ because the roads once you get into darkest Poland are a nightmare – they’re single carriageway and are inhabited by some of the maddest ai drivers you could wish to meet! Going straight across Poland from Berlin to Warszawa isn’t too bad as that route is all dual-carriageway but we’ll need to turn off at Poznań and from there it’s eyes-on-stalks driving up via Bidgoszcz to Olsztyn. I’m giving a slightly wrong impression here – the drive is through some great scenery. It’s just that when you get to the other end, you will breath a sigh of relief if you’ve got away with just a paint scrape! Crossing Poland is synonymous with crossing the Vistula. 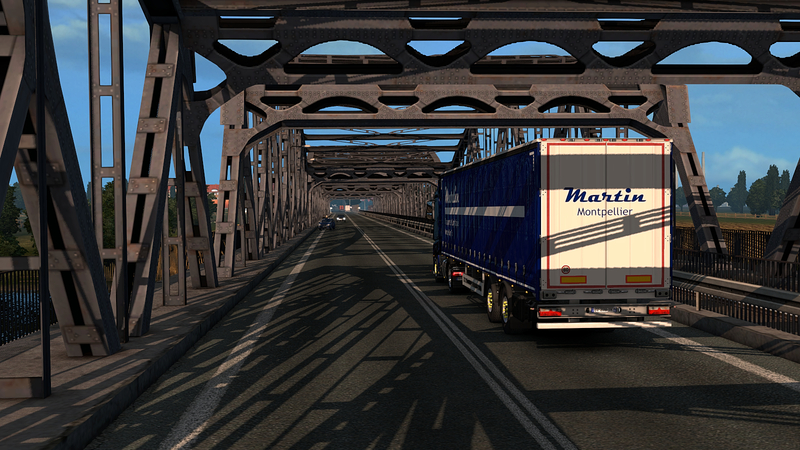 Here we are crossing the famous bridge at Toruń… …It’s a shared bridge with a railway track running alongside the road. I see a couple of drivers have had a minor accident on the on-coming side. I arrived in Olsztyn after rubbing my wheel hubs against the concrete barrier at some roadworks where a minor scrape was preferable to colliding with oncoming traffic – see what I mean 😉 After maintenance and a rest we were off to Košice in Slovakia. According to the route planner this is a 7 hour drive – someone’s having a laugh! From there we found ourselves on better roads for the final run down to Košice. Always up against it, we picked up two 160 euro sleep avoidance fines as we busted our driving hours. For the record, the in-game driving allowance is 11 hours (gameclock) before you must rest. Rest periods are 9 hours if I remember correctly. This is not actually in line with the real world EU driving times but it’s a good compromise. So – you can see that somewhere along the ‘7 hour’ run we burnt over 4 hours. The job itself was only allowing 12 hours so taking a break on route was never a option. I’m impressed that you can keep the rules of the road straight, traveling as you do across so many borders. How difficult has it been for you maneuvering on different sides of the road? I would think that to be a significant challenge, but you seem to do quite well! 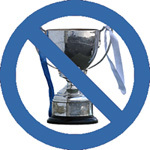 The rules of the road are not too difficult either. There is overarching European law which standardises road signs such as speed limits, give way and stop signs. That right of way sign in Poland is exactly the same as ones that I would see in England – the only difference is the background color which would be white over here. Interestingly there is also a priority sign which is a yellow square on a white square – if you see those you have priority over traffic joining your road. If you see the same sign with 3 black bars across it then you no longer have priority and should give way. Individual countries can then set their rules with the knowledge that the drivers should be able to understand what is required by the signs they see. It’s a bit like Federal Law and State Law in the US.